From the Batman collection by Diamond Select. 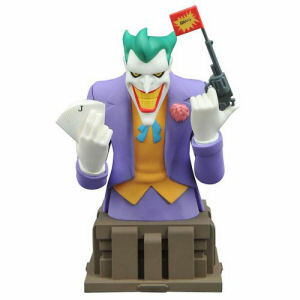 Batman The Animated Series Joker Bust. From the Batman collection by Diamond Select. Batman The Animated Series Joker Bust. The bust measures approximately 6 inches tall .Made of resin and packaged in a full-color window box. Includes certificate of authenticity. The limited edition of 3000 pieces is sculpted by Varner Studios. Diamond Select Batman Figurines shipping from Canada. No Surprise Border fees or Customs!